The coaster doesn’t have any inversions, but its soaring height, wild speed, and extreme G-forces make it one thrilling experience. 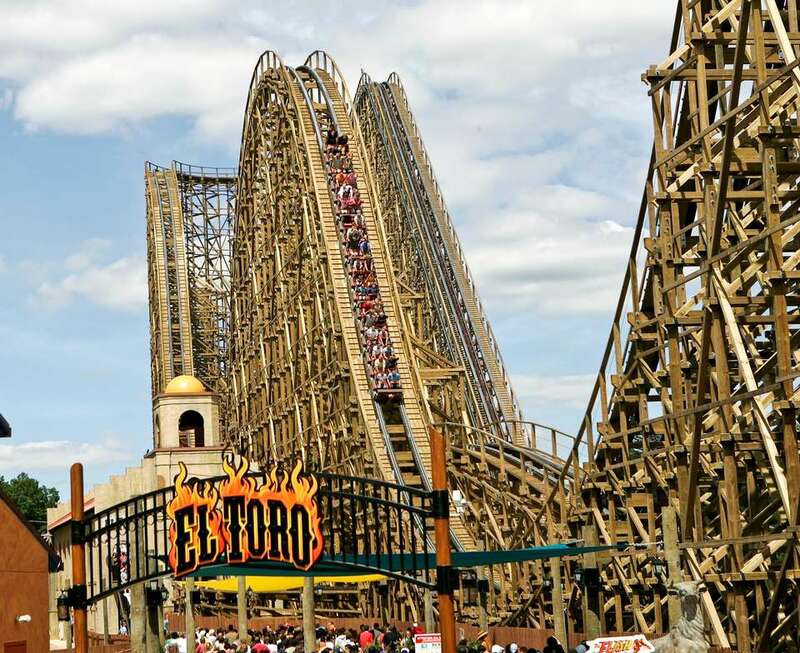 El Toro is one of the top 10 fastest wooden roller coasters. If the sight of El Toro’s massive track wasn’t enough of a clue, the actions of the ride operators in the loading station should have tipped us off about the ride’s ensuing madness. They “stapled” (a wonderful term coaster freaks use to describe the overzealous tightening of safety restraints) us and our fellow riders to within an inch of cutting off our respiratory and circulatory functions. The extra precautions may have been due more to the ride’s balky sensor the day we rode than sadistic ride ops. But we didn't have much time to fret over our labored breathing, as the train departed the station, rounded a bend, latched onto the lift mechanism, and cruised up the 188-foot lift hill at a surprisingly fast clip. Unlike the majority of coasters (especially wooden ones), El Toro uses an elevator cable lift rather than a traditional lift chain. Once the entire train is on the lift hill, the cable revs up to about 14 mph without any of the hesitation or clattering clack-clicks of a lift chain. It is almost eerie how quickly and quietly the cable delivers the train to the ride’s precipitous apex. The subsequent screams, however, promptly shatter the silence. At 176 feet, El Toro’s first drop is among the longest for a wood coaster in the U.S. (and the world, for that matter). Its 70-mph top speed makes it among the fastest wood coasters anywhere as well. At the time of its debut in 2006, its 76-degree angle of descent was the steepest for any wood coaster. Hence, the screams. The first drop is immediately followed by three substantial hills of 112 feet, 100 feet, and 84 feet. This generates wild, prolonged, airtime (that giddy butterflies-in-your-stomach sensation that coaster fans crave). Even with our lap bar cinched tightly, the airtime on our ride was glorious. The train banks into the turnaround and navigates some bunny hills for more intoxicating airtime. A fifth drop remains surprisingly potent, but delivers a spasm of ejector air, rather than the more gentle floater air of the initial drops. El Toro then mercilessly, yet somehow smoothly, tosses its passengers around with a series of extremely banked twisting elements before returning to the station. We knew the stats. We even knew about the ride’s unique prefabricated wood track. We were prepared for the height and speed, and anticipated some decent airtime. We were not, however, expecting El Toro's silky smoothness. It was unlike any wood coaster we’ve ridden. Rather than the rickety rough-and-tumble woodie sensation epitomized by the classic Cyclone at Coney Island, El Toro was as rock-solid as Great Adventure's wonderful Nitro or other stellar examples of steel coaster engineering. Not that we would recommend it, but a surgeon could probably safely perform a circumcision while riding El Toro. Why is the ride so smooth? Like two other thrill machines from Intamin of Switzerland (Balder at Liseberg in Sweden and the 196-foot Colossos at Heide-Park Soltau in Germany), the manufacturer laser cut the ride’s track to exacting standards at its factory. Instead of nailing together pieces of wood like a conventional coaster, it bonded and laminated them to create the track sections. Rather than cutting and assembling wood timbers on site, the builders snapped the track sections together like puzzle pieces. Technically, the ride is made out of wood, but it is unclear whether it is appropriate to consider it a wood coaster. The ride manufacturer, Rocky Mountain Construction, has confounded the amusement industry with the introduction of its wooden-steel hybrid coasters. They marry a steel track shaped like an I-beam to a wooden structure. The less common plug-and-play wooden coasters, like El Toro, are closer to conventional wooden coasters, but the unique method used to design and build them make them distinct from their wooden brethren. By dialing down the characteristic rickety rumblings, El Toro is able to focus on its considerable strengths of speed and wigged-out airtime. The wonderful ride ranks up there—way up there—with any coaster, wood or steel, and that’s no bull. We include El Toro among our list of the best roller coasters. We also include it on our rundown of the 11 scariest coasters.